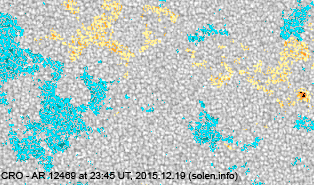 Last major update issued on December 21, 2015 at 04:00 UT. 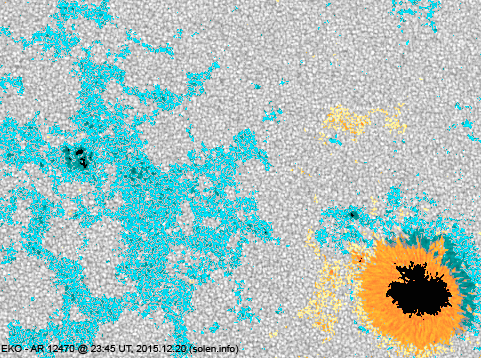 The geomagnetic field was active to major storm on December 20 under the influence of CME effects. 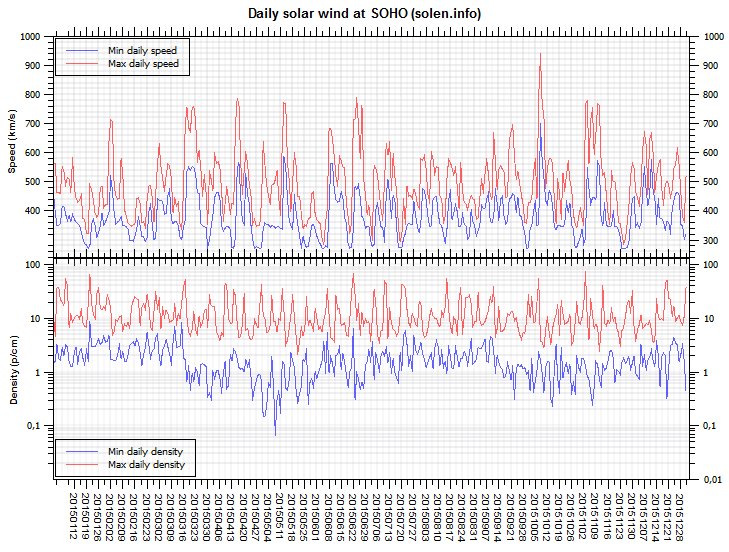 Solar wind speed at SOHO ranged between 363 and 504 km/s. 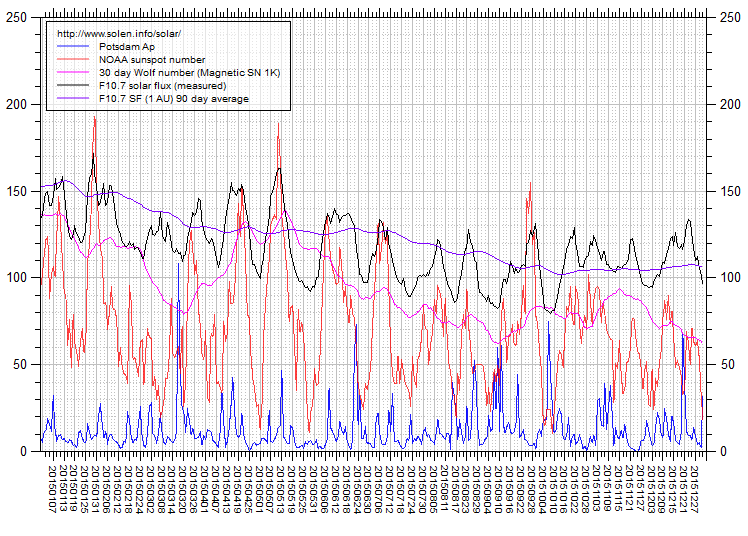 Solar flux at 20h UTC on 2.8 GHz was 116.6 (decreasing 3.1 over the last solar rotation). 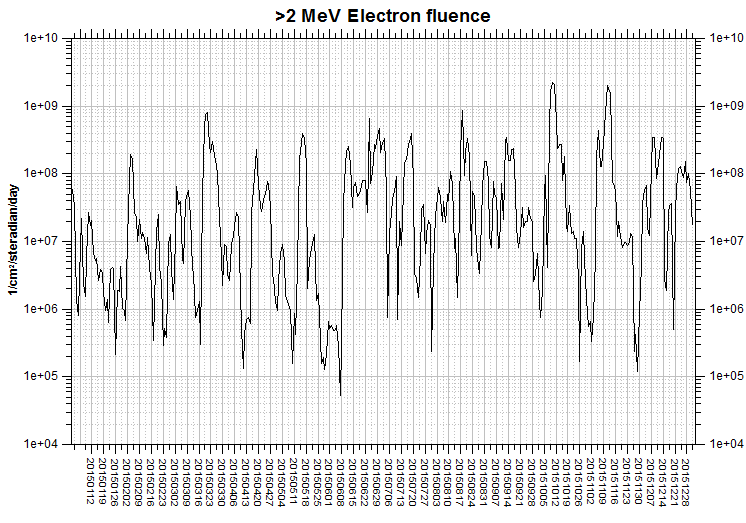 The 90 day 10.7 flux at 1 AU was 106.9. 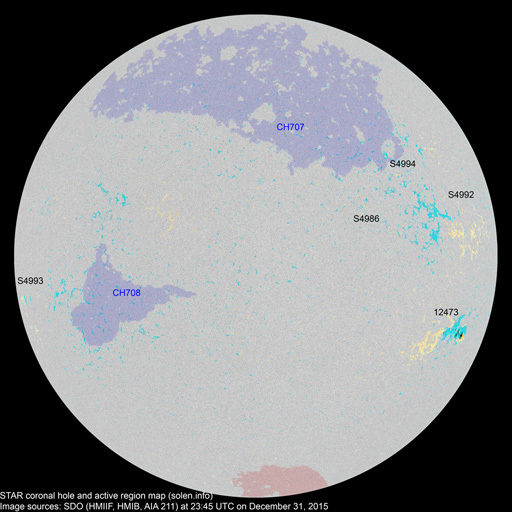 The Potsdam WDC planetary A index was 67 (STAR Ap - based on the mean of three hour interval ap indices: 67.0). 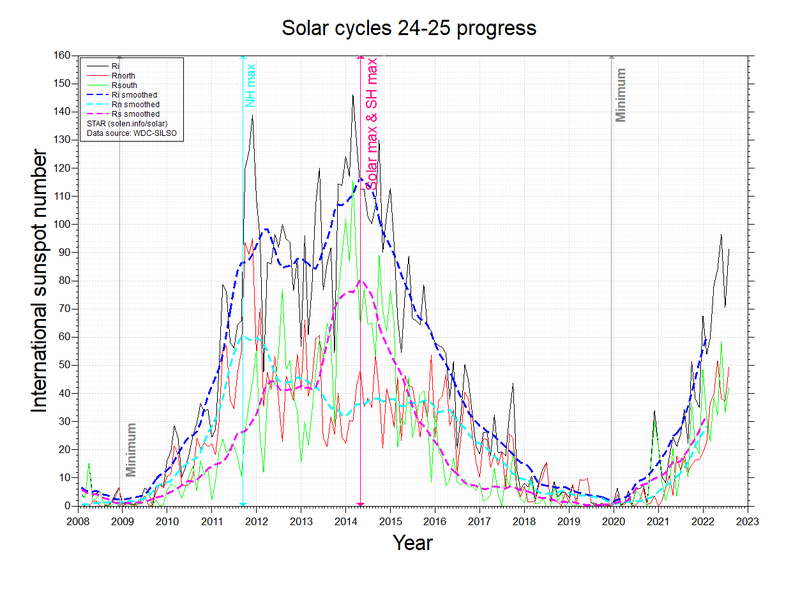 Three hour interval K indices: 46646666 (planetary), 36455644 (Boulder). At the time of counting spots (see image time), spots were observed in 4 active regions using 2K resolution (SN: 85) and 2 active regions using 1K resolution (SN: 31) SDO images on the visible solar disk. Region 12468 [S14W67] decayed slowly and was mostly quiet. Region 12470 [N13W24] decayed slowly and quietly. S4968 [N20E18] reemerged with tiny spots. S4970 [S19W33] reemerged with tiny spots. 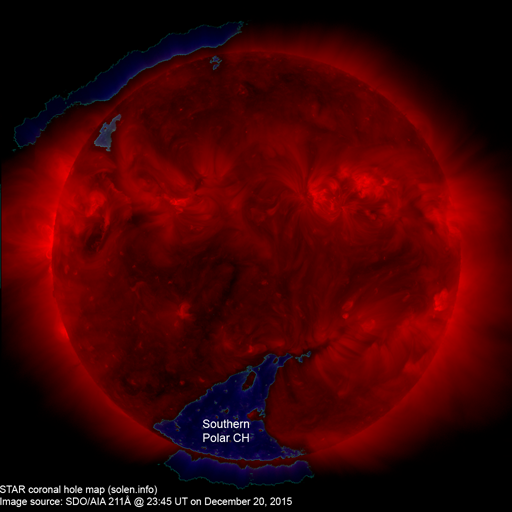 An active region at the central east limb produced most of the flares during the day and early on December 21. 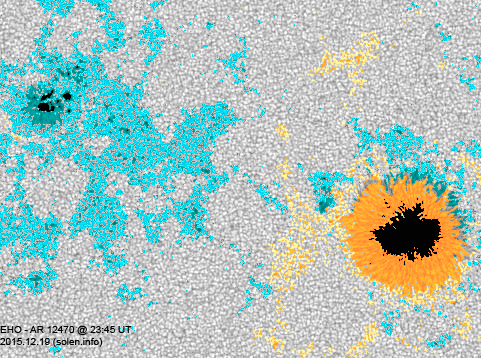 Further M class flares are likely as the region rotates into view. Long distance low and medium frequency (below 2 MHz) propagation along paths north of due west over upper middle latitudes is very poor. Propagation on long distance northeast-southwest paths is poor. The geomagnetic field is expected to be quiet to major storm on December 21 due to CME effects becoming quiet to unsettled on December 22. Quiet conditions are likely on December 23.